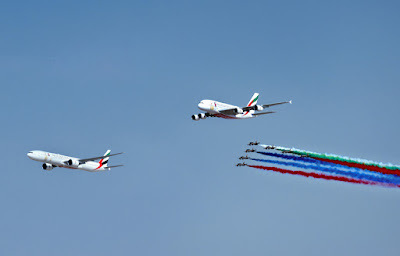 The Dubai Air Show has kicked off with a spectacular flypast by the UAE aerobatic display team and an Emirates A380. The Dubai Air Show, one of the leading airshows of the world also launched with a flurry of orders for commercial aircraft. One of the first announced from Boeing was an order from Emirates for 40 787-10 Dreamliners, it is a deal which includes the aeroplanes and related equipment, is valued by Boeing at $15.1 billion at current list prices. Although, thanks to discounts, tax breaks and US Government subsidies the price is much much less. 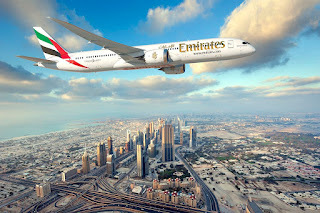 The Dubai based Emirates has rapidly grown to become one of the worlds biggest airlines as well as the largest Boeing 777 operator in the world. They will be the first airline to receive the new 777X due in 2020. The 787-10 will both complement the Emirates 777 fleet as well as replacing some of the older models. It is said to have a 25 percent better fuel efficiency per seat and emissions than the aircraft it replaces. 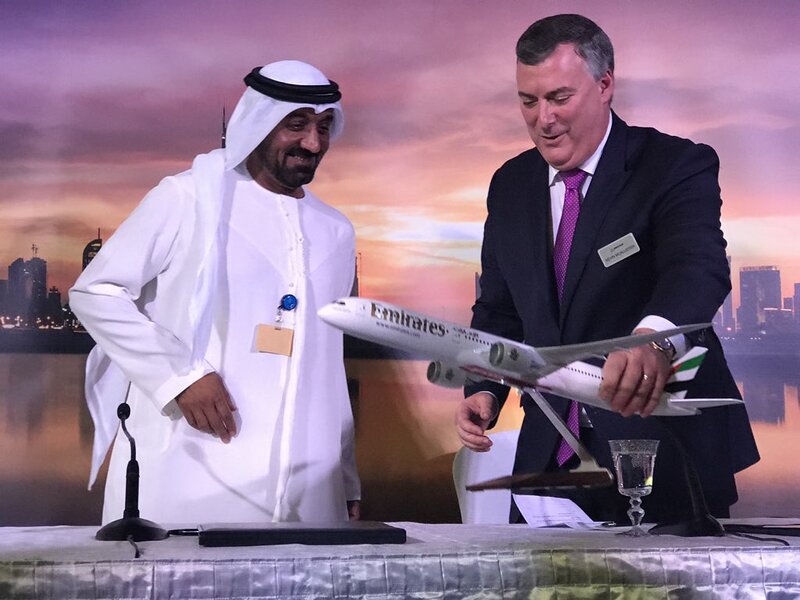 Emirates is not the only airline to place an order for Boeing's Dreamliner products on the first day of the Dubai Air Show, Azerbaijan Airlines announced an order for five more 787-8's it also made a commitment to buy two large freighters. Boeing says the order is worth about $1.9 billion at current list prices, however, most industry commentators believe the true price is half that amount. Azerbaijan Airlines also announced it will be the launch customer for the 787 Landing Gear Exchange Program whereby Boeing Global Services will provide the carrier with a lower-cost solution for overhauled and certified landing gears for its Dreamliner fleet, which now grows to seven aircraft. 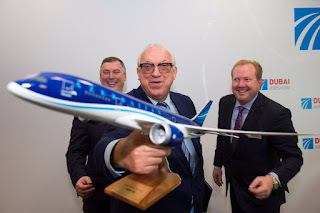 "Ordering additional 787 Dreamliner airplanes will greatly expand our airline's capabilities, allowing us to serve new destinations and carry more passengers," said AZAL President Jahangir Askerov. "We are delighted to expand our partnership with The Boeing Company, which has been a reliable partner in supplying modern airplanes, and helping us operate and maintain the jets." "We appreciate Azerbaijan Airlines' growing confidence in the Boeing 787" said Kevin McAllister, president and CEO of Boeing Commercial Airplanes. Azerbaijan Airlines has grown to become one of the major air carriers in the Central Asia region, serving some 40 destinations in 25 countries. The airline currently flies two 787 airplanes as well as a fleet of Boeing 757 and 767s.